I was lucky enough to be invited to the YLG South West Unconference by my librarian, the wonderful Tracy. An Unconference is a gathering that has minimal planning. People decide what they want to talk about and then split into groups. Beforehand, you had to make your own badge, with just a name; no hint at what you do. 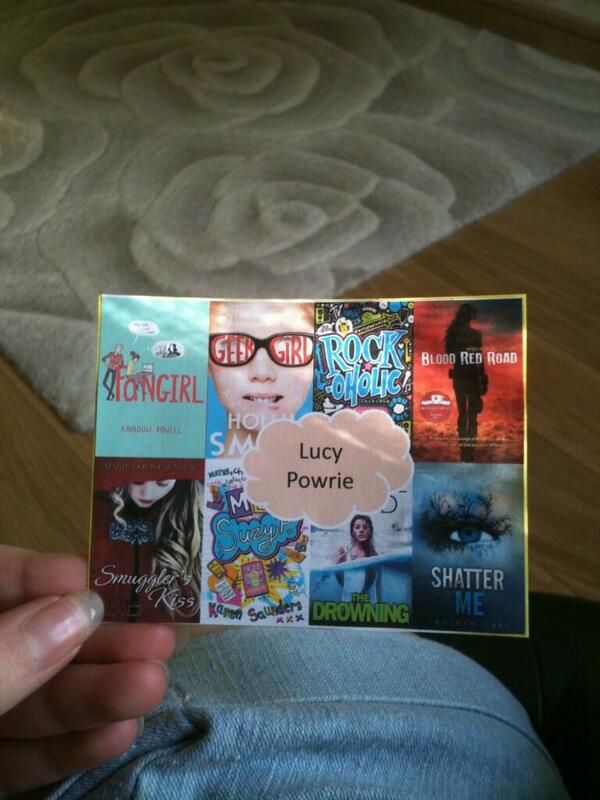 This was the badge that I made and it features some of my favourite books and book covers. I was actually quite pleased with it and it didn’t take me too long to make. There were a lot of people with some amazing badges, including ones that had been crocheted and another fab one of Elmer, the patchwork elephant. After listening to the housekeeping, everyone wrote down a few things that they wanted to talk about and then mingled, viewing each others badges. The post it notes were then sorted into groups and people chose the group that they were most interested in. I chose to go to the new technology group and found out a lot about the ways that QR codes are used and how librarians are using technology to attract people to visit libraries. After lunch, there was a quick game of ‘agree, disagree’ and everyone was split about whether non-fiction paper books will become ‘extinct’ (or something along those lines!). I suppose that’s the nature of the game! There was then a whole group talk where we all shared book recommendations and I know I’m definitely going to go away and pick some of them up, especially Code Name Verity by Elizabeth Wein. There was then another split and I went and spoke with another group of people who were still discussing books. This was by far the best part of the day and I got to chat with the rest of the group, who were all lovely! I felt so welcome, especially as I was the youngest there. It was really great to meet Karen Saunders because I loved her book Me, Suzy P and I’m hoping to meet her again sometime in the future. I left before I could talk to her properly which was a shame. I’ve since spoken with Karen Saunders and Dan Metcalf on Twitter, both of whom were at the event. I’d love to do something similar because it was such a fun day and I got to meet so many people and learnt a lot. Thank you to Tracy for inviting me along and to everyone who made the day so super! Sounds like you had a really great day! Wow definitely sounds like a lot of fun! Great badge, Lucy 😀 Totally Fangirled when I saw Geek Girl haha! Seams like you had an amazing day, I’m sure I would have loved it. I’ve never heard of it before. You’re badge is really cool and looks professionally done. This sounds like great fun! I quite like the idea of making your own badges, I love yours. Sounds like you had a great day, thanks for sharing. WOW! This event sounds like so much fun 😀 You’re so lucky to have a great connecting with my librarian! My school librarian doesn’t even care about reading -.- I’m glad you had a good time! The badge making is a great idea. I can see some good book covers on yours 😉 But no Infernal Devices?! *gasps* I have heard good things about Code Name Verity so I hope you enjoy it when you get round to reading it.